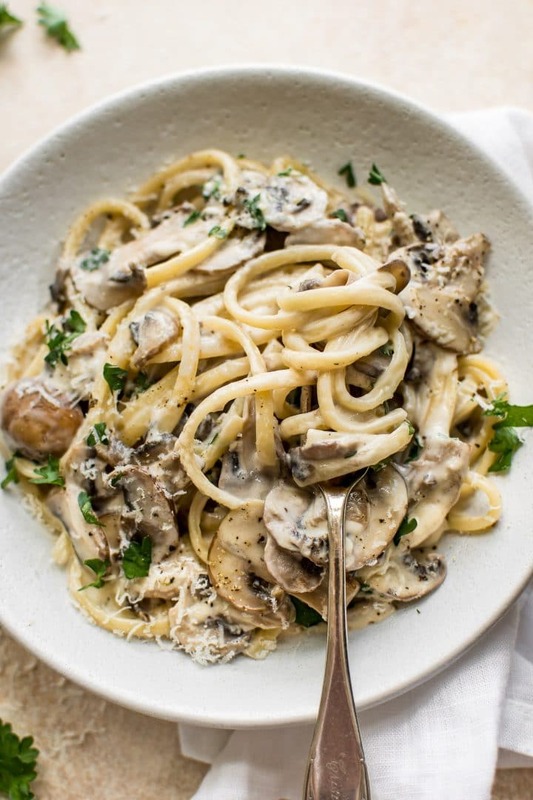 This creamy mushroom pasta recipe makes a delicious vegetarian weeknight dinner! Ready in about 30 minutes. Since there’s no meat in this dish, and you can skip the parmesan cheese if you wish, I’d say it’s just decadent enough without being too much. I used cremini mushrooms in this recipe, but white mushrooms or baby bellas would work well too. 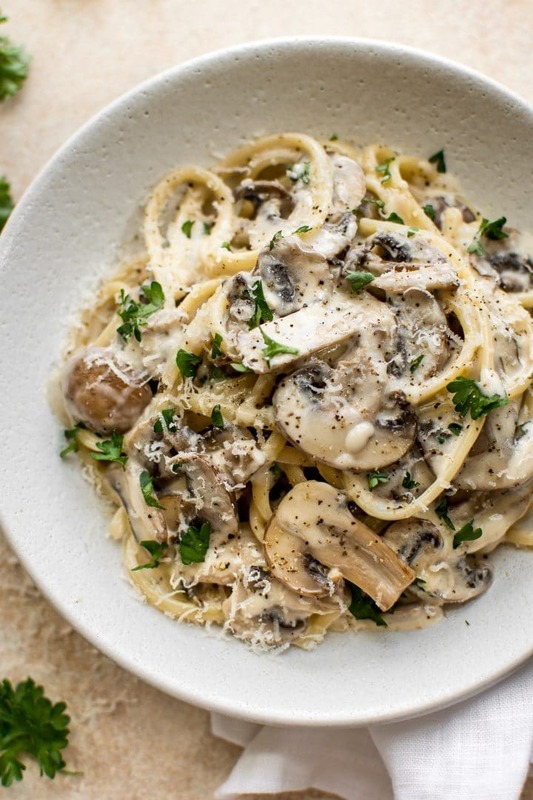 Making this creamy vegetarian mushroom pasta is easy. You start by sautéing the mushrooms with some oil, butter, and garlic. After a few minutes, take them out of the pan temporarily. You then make a quick pan sauce with the lemon juice, white wine, seasoning, flour, Dijon mustard, and cream, and then add the mushrooms back in. Finish off by tossing the delicious sauce with your pasta of choice. That mushroom white wine sauce is so tasty. Pro tip: Don’t consume alcohol? Replace the white wine with chicken broth (or veg broth if you’re vegetarian). I love the mushrooms + cream combo. I have a pretty recent recipe for creamy garlic mushrooms that you should definitely check out if you feel the same way! 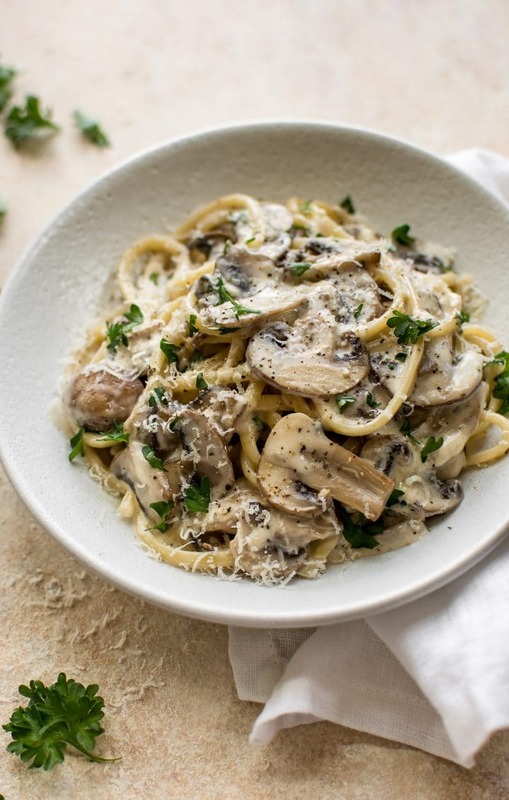 Love mushroom pasta recipes? You may also like my chicken bacon mushroom pasta or my vegan spinach and mushroom pasta. Boil a large, salted pot of water for the pasta and cook it al dente according to package directions. Meanwhile, add the butter and oil to a skillet over medium-high heat. Add the mushrooms and garlic to the pan and sauté for about 5 minutes, stirring often, until the mushrooms release most of their water and it's cooked off. Add the wine, Italian seasoning, lemon juice, flour, and Dijon mustard to the pan. Stir until it becomes a smooth paste. Stir in the cream and let it simmer for a couple of minutes. Add the mushrooms back into the pan. Reduce the heat and cook for a few more minutes until the sauce has thickened up a bit. Season sauce with salt & pepper as needed. Drain the pasta and toss it with the sauce along with the parsley and parmesan if using. Since I have a cold, I think this would really make me feel better. Bring me some now. Oops! Just updated the recipe. Sorry about that. Can’t believe I missed it even with proofreading. So sorry! Just updated it. I just sent this to my partner and told him to get cooking haha. Looks AMAZING! I think even Tom could make this one for me Natasha! It looks like it needs to be a regular around here! Tom and I would both love it! What an awesome and easy to make weeknight dinner idea! I just made this, and it’s very easy and tasty! I’ll make this pasta on a regular basis from now on, and I’ll try your grilled eggplant and spinach salad this weekend. Thanks!!! When do you use the flour? Did I miss it? This recipe turned out FANTASTIC! my partner who is NOT a pasta person also fell in love with this recipe. Thanks a million! Sure! I think that would be delicious. Lovely recipe, I added some edamame beans for protein and it was delicious! what can i substitute for white wine?